Would you pull your teeth out in the event of a zombie invasion? 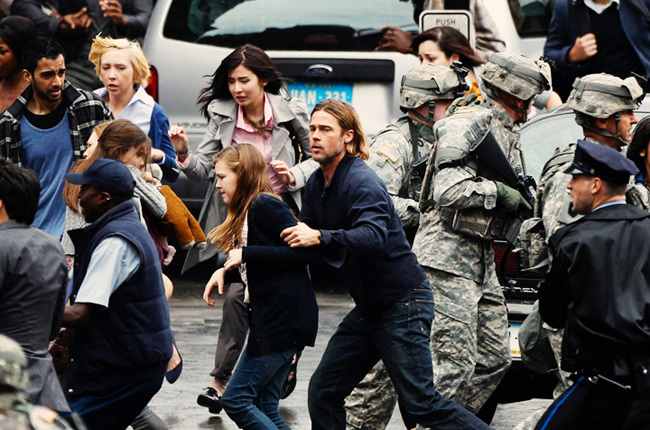 "World War Z" doesn’t pose the question, although the idea is hinted at. The evolution of zombie films has taken off since “White Zombie” in 1932 until now. From slow zombies with no direction other than what their voodoo master tells them to fast zombies bent on spreading infection, the genre is wide open. “World War Z” plays out like “Contagion”, or “Outbreak” but with zombies. Flaws aside, it’s a suspenseful, well paced film that entertains. The film starts out with a routine introduction to the Lane family. Gerry (Brad Pitt) and Karin (Mireille Enos) are awakened by their daughters followed by a “loving” breakfast together where Gerry shows his pancake making skills. The great thing about the film is that the action picks up fairly quickly after we witness the poor chemistry of the Lane family. The pandemic breaks out in a non-routine way as the family is in the car in the middle of a busy Philadelphia street. It takes you by surprise as the mayhem ensues. From there, the Lanes have to stay on the move to avoid the zombies. We quickly find out that Gerry is a retired United Nations investigator who was so important that UN Chief Thierry Umutoni (Fana Mokoena) is willing to evacuate him and his family by helicopter from the apartment complex they stow away in for the night. Once Gerry is back in UN custody, the mystery of what is happening with the pandemic on a global scale kicks into warp speed. (Again, the movie revolves around Gerry while Karin and the kids are just a plot piece for his character.) Gerry is sent to South Korea with a brilliant young scientist who seems to be mankind’s hope for surviving. Again, the film throws you for a loop as *spoiler alert* “hope” is lost in the form of a freak accident, putting everything on the shoulders of Gerry. From there the film consists of Gerry hopping around the globe trying to solve the mystery of what happened while simultaneously trying to find a cure. Some of the encounters are implausible but the pacing of the film succeeds in keeping you on the edge of your seats or yelling “run, run run!” when things get sticky. Overall, Brad Pitt is like-able enough to carry the film across the goal line. From the opening credits, images of swarming insects, bugs and animals fill the screen. One of the great images in the film is the swarming zombies that run in packs and the living running for their lives in the same way. Cinematographer Ben Seresin did a great job in painting the palette for the creatures to roam in the frame, as well as the scary moments in dark hallways with flickering lights. My only gripe is that “World War Z” asks for you to suspend your disbelief in a few areas. If you can get past the fact that the Gerry is the definition of Law 10, Infection, from 48 Laws of Power then the film becomes very suspenseful. It seems that every where that Gerry goes in trying to solve the mystery and look for a cure, the zombies take over a once sterile environment or kill most of the people he is with. So Gerry is almost an infection himself. Understandably, if the zombies didn’t swarm, then there wouldn’t be much of a movie. Also, this is another film where our hero makes all the right decisions. I highly doubt anyone in that situation would make the right decision every time. That’s a problem with the writing, but we’ll roll with it. Where the film lacks in character development, it succeeds in action and “I didn’t notice I’m holding my breath” suspenseful pacing. Although at times I wondered if seeing it at home in a dark room would have made it even scarier, the film is worth your hard earned cash.